Every true fashion lover needs at least one show stopping hat in her closet. The simple addition of a hat can take a once bland look and instantly turn it into a stylish ensemble. A given plus is that hats are the perfect disguise to the dreaded bad hair day. Try adding a feather adorned fedora or a luxe floppy hat to one of your layered winter ensembles. Below are some of my favorite hats currently available. Click the picture to shop your favorite! Don't miss my ROCK look that I show you today including a Givenchy style tee and Prada Style suede bag. Gorgeous maxi dress! I like your boho style. I love hats too.Especially in summer I`m a hat addicted. Love this style with the hat. I would love to wear a hat but I think every time it looks not good on me. I really do need to add more hats to my closet. I really like your bowler hat. Cute. I love hats, and I love how tou wear it, and your selection "how you can wear it" !!! Let come to see my new Post !!! I wait you :-D Kiss from Italy ! Fabulous dress and I love that hat! Another great post. Love your dress. I agree, hats are such a great (and quick!) fix to turn simple outfit to a super stylish one! And they are a saviour when your hair just doesn't listen to you that day. I absolutely love the wide-brimmed hats and fedoras - so chic! I'm looking for a gorgeous hat! I always look at them in stores and think ooh no won't wear that but always regret it when I get home.. If you get a sec, check out my latest post 'Structured Stripes'. Gorgeous look! I adore the dress. I love this outfit and the dress looks so good on you. I need to get myself a hat! I'm not really a hat person, but I do love that chevron-y ASOS hat, very cute. Cute! I just got a fun hat yesterday too! I've been dreaming of a hat for a while- you've convinced me. You look so adorable!! I am addicted to hats...great roundup!! I haven't really gotten into the hat trend but seeing these pics make me wanna go out and get a few. Great post. So obsesses with hats and that maxi. Great. That dress is gorgeous! I'm making an effort to wear more dresses this spring/summer, especially flowey maxis like this! Love this dress and love your hat. You look so beautiful! Wow you look really beautiful. I love that look on you! I completely agree! 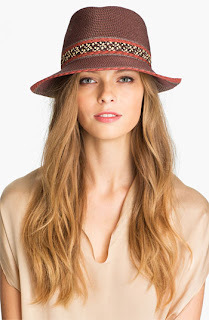 I have been eyeing a hat at Tory Burch and just keep waiting to take the plunge! I like your hat :) I agree that hats can completely transform a look. My favorite out of the celebs is Rachel Zoe's look. She always looks so fabulous! That is definitely a show-stopping hat and it goes perfectly with your look! I'm really enjoying the theme/design of your site. Do you ever run into any web browser compatibility problems? A handful of my blog visitors have complained about my blog not working correctly in Explorer but looks great in Chrome. Do you have any ideas to help fix this problem? I love hat so much. They really are the perfect accessory, those and scarves. I love your outfit in this post too!! So cute. 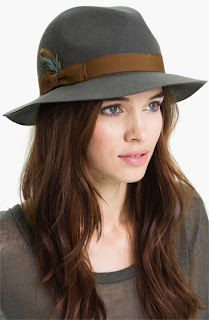 I think I've completely decided that I want a fedora finally :) It'll be my first hat ever! that hat looks SO flipping cute on you!! i feel like i own sooo many hats but can never truly figure how to totally rock them! love the inspiration pics you found! I may as well check thіngs out. І lіke what ӏ see so now i'm following you. Look forward to finding out about your web page yet again. Great outfit, that hat suits you really well! The hat is simply amazing, Anna! I always enjoy your blog posts! I love your style! I like it to wear hats, too, and the selection which you´re showing is so beautiful. I've been loving hats this winter too! Beautiful hats. My favorite is the black one with the feather. I love hats, but I just can't find one that I think looks good on me! Great look and you are right the hat tops it off perfectly. PS Where was this photo taken (if you don't mind me asking)? These are so cute! Love the hats! Your style is beyond amazing! on a website or I havе ѕomething tο cоntribute to the dіscuѕsіοn. Uѕually іt is a геsult of the pаsѕіon communicаted in the post Ι browsеd. Anԁ on this рοѕt "Top It Off". questionѕ fоr yоu if you tend not to minԁ. comments looκ liκе theу aгe comіng frоm bгain deaԁ individuals? :-P And, if you arе writing at addіtional onlіne sіtes, I'd like to follow anything new you have to post. Could you make a list the complete urls of all your shared pages like your twitter feed, Facebook page or linkedin profile? Stunning, you really look good in a hat! Sadly I cannot say the same haha. Great post! Now I want to run out and buy more hats! Love your dress here. I love hats too, so this is my knid of post! I love hats too, and toatlly agree that they make an outfit! I am dying to know where dress is from? I love it!